Elliebelly Knit & Dye Works > Blog > Art > A little bit of this….and a little bit of that. A little bit of this….and a little bit of that. I was excited to finally get a little bit of studio time this morning while my angel baby played with a friend. 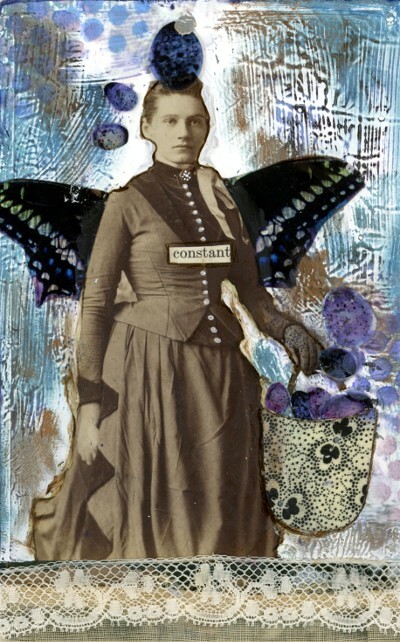 The weather here is gorgeous, so I couldn’t stay in for long, but I worked on my altered cabinet card for Lou McCulloch’s box of altered women and I also made some art for a trade with the uber-wonderful Carla Naron (if you don’t read her blog, you should). This was the first cabinet card I had done in a long time, but the other altered dames inside of the cool wooden box Lou decorated for this round robin were an invitation to whimsy. On the back it reads "Eunice got stuck looking after all their important ideas. It wasn’t really fair, but then so much of what happened to them wasn’t." I couldn’t spend much more time indoors, it was so pretty. So I took some bamboo velour outdoors to dye. This was a combination of dip-dye and low water immersion with a loosely scrunched fabric through two different dye baths, and it seemed to take forever with three yards of it to do, but the weather was so nice it didn’t matter. I’m torn between using this to make play clothes for the kids and a sort of big, loose, blue fish style tunic for me. the fabric is way prettier than the photo which looks sort of washed out. 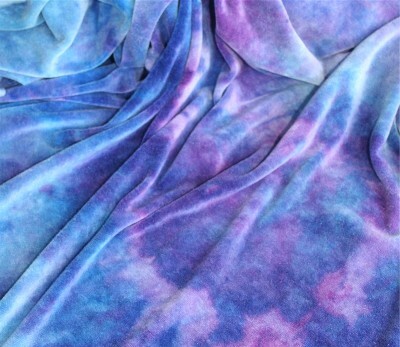 I poured soda ash solution over the fabric almost immediately during the orchid dye bath, to get the dye to stretch out and give a nice halo effect over the lavender-blue beneath it. Finally I have to show you my little angel baby who is so in love with his patchy panel pants from Dancing Bears that he refused to take them off. Just flat out refused. He really loves them.